Lewisia is a plant genus, named for explorer Meriwether Lewis, who encountered the species in 1806. The native habitat of Lewisia species is north facing cliffs in western North America. Local Native Americans ate the roots, which have also been used to treat sore throats. Lewisias are perennial alpine plants. They produce rosette-shaped flowers that may be one of a range of different colours. Lewisia cotyledon grow up to 0.5 metres (1.6 ft) in height and width. Most species of Lewisia are deciduous, including the original Lewisia rediviva. Lewisia longipetala is the only semi-deciduous species. Some species, such as Lewisia cotyledon, are evergreen. Meriwether Lewis, of Lewis and Clark fame, is credited with the first discovery by a European or American of Lewisia, which was known to the local Native Americans as bitterroot. Lewis discovered the specimen in 1806 at Lolo Creek, in the mountain range that became known as the Bitterroot Mountains. The plant was given its scientific name, Lewisia rediviva, by Frederick Traugott Pursh. Lewisia columbiana (J.T.Howell ex A.Gray) B.L.Rob. 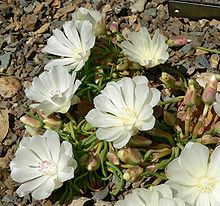 Lewisias are naturally found in western parts of North America. In their native habitat of north-facing cliffs, lewisias are subject to extremes in weather conditions. All species of Lewisia are edible. Lewisia rediviva has a large edible root and as a result became a food source for local Native Americans. The root is peeled before boiling or steaming; cooking the root reduces its bitterness. L. rediviva has also been used for medicinal purposes; chewing the root was used to relieve a sore throat. It has also been used to promote milk flow during lactation. For gardening, Lewisia species are usually planted in rockeries, because this mimics their natural habitat. Rockeries also provide the free drainage that lewisias need to prevent their roots rotting. They may also be planted in pots, though they need to be well drained and protected from sustained wet weather. ^ "Lewisia cotyledon AGM". Royal Horticultural Society. 2011. Retrieved 31 July 2012. ^ "- Lewisias". Alpine Garden Society - Bedfordshire group. Retrieved 31 July 2012. ^ Charles Lyte. "In focus: Lewisia". The Telegraph. Retrieved 31 July 2012. ^ "Bitterroot Plant Trivia". Bitterroot Heaven. 2007. Archived from the original on 15 April 2012. Retrieved 31 July 2012. ^ Unless otherwise sourced all items in this list use: "Classification for Kingdom Plantae Down to Genus Lewisia Pursh". United States Department of Agriculture. Retrieved 4 August 2012. ^ Edna Ray-Vizgirda (13 October 2012). "Sacajawea's bitterroot (Lewisia sacajaweana)". United States Forest Service. Archived from the original on 20 June 2013. Retrieved 4 August 2012. ^ "Lewisia ×whiteae Purdy [cotyledon × leeana]". United States Department of Agriculture. Retrieved 5 August 2012. ^ "Bitterroot - Lewisia rediviva Pursh". Plant-life. Retrieved 31 July 2012. Clayton, Phil; Drury, Anita (2012). "Succeed with Lewisia". The Garden. 137 (6): 36–37. Vizgirdas, Ray; Rey-Vizgirdas, Edna (2009). Wild Plants of the Sierra Nevada. University of Nevada Press. p. 384. ISBN 9780874177893. Wikimedia Commons has media related to Lewisia. This page was last edited on 20 August 2018, at 01:07 (UTC).